"And ooh ma.. Look at that tiny jaw. With sharp teeth! Touch it!" Said Obi while brushing her tiny fingers to the replica of piranhas' powerful jaws. Bo et Obi happily bombarded me with questions and answer them themselves while we were walking along the Ocean view room at New York Aquarium, Coney Island, that day. And how we all look forward to have a lovely summer. Here in NYC, kids have been enjoying their summer break since June 26. And since we have no summer classes this time, my hubby and I are working on making sure that the kids, and their parents as well :), have an enjoyable, yet rewarding summer break. Not that easy though..particularly as I still have to work full time and the UN, somehow, is still packed with meetings. Nevertheless, whenever we have day-off and weekends, we try to go out with the kids. During the Lebaran week, we managed to go to the Coney Island. Well, first destination here is the New York Aquarium. 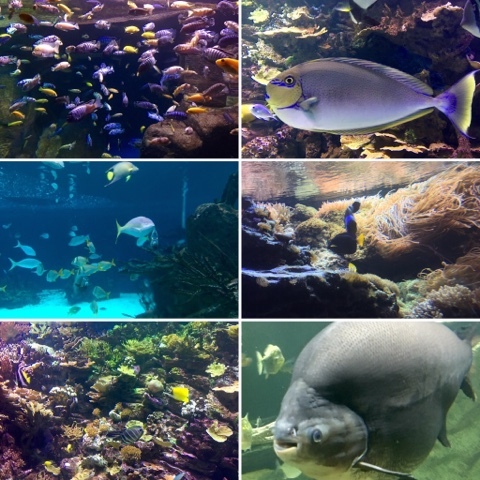 New York Aquarium is part of the Wildlife Conservation Society (WCS). As and ID NYC holder, my hubby and I can get 1-year free membership of the WCS which includes, among others, the New York Aquarium, Bronx Zoo, Central Park Zoo, Prospect Park Zoo and Queens Zoo. So can visit those places for free. Cool, right. As for the kids, as they do not have the ID yet, we still have to pay for their admission. It usually costs $12 per person older than 2 years, but that day it was only $10. 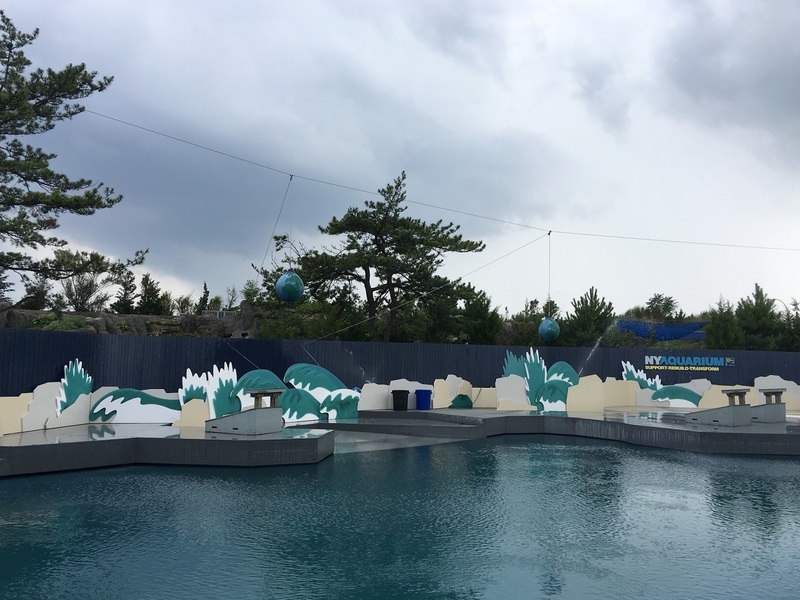 New York Aquarium is undergoing a major change after the devastating storm Sandy. They are rebuilding and transforming this place but we still have a lot to enjoy. Coming from Indonesia, the largest archipelagic state, we pretty much miss the ocean and all its interesting creatures. And at this point of time, New York Aquarium is a prefect place to see those beautiful underwater world and spend some quality time with the kids, while at the same time getting closer and getting to know more about nature's wonder. There are a few places you can visit and enjoy with your kids. This is part of the Ocean View Room, our first stop right after entering the aquarium. And kids (as well as adults) will surely enjoy those great variety of fish and ocean critters from Atlantic, Pacific, Caribbean Oceans and more. Nemo or clown fish are abundant, so is Dory :). Not to mention mantarays and piranhas. I really love this part as we get to see different types of fish from many corners of the world. 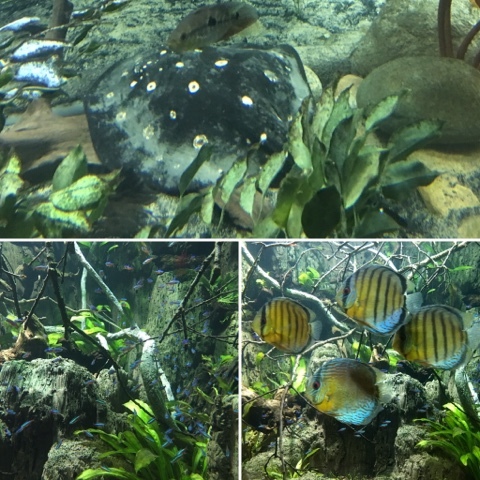 My kids got so excited when they saw them so close, found out that piranhas are small yet have super strong jaws. For me who constantly missing the amazing underwater world of Indonesia, this spot is like a tiny home-sweet-home. I let myself immersed in those calming blue water and colorful schools of fish swimming freely right in front of my eyes. I wish I could join them. the real 'aquarium' in Bunaken, Manado, Indonesia. Then we also visit the Conservation Hall. And outside the Ocean view room, we have 2 sea cliffs, for walrus and penguins. 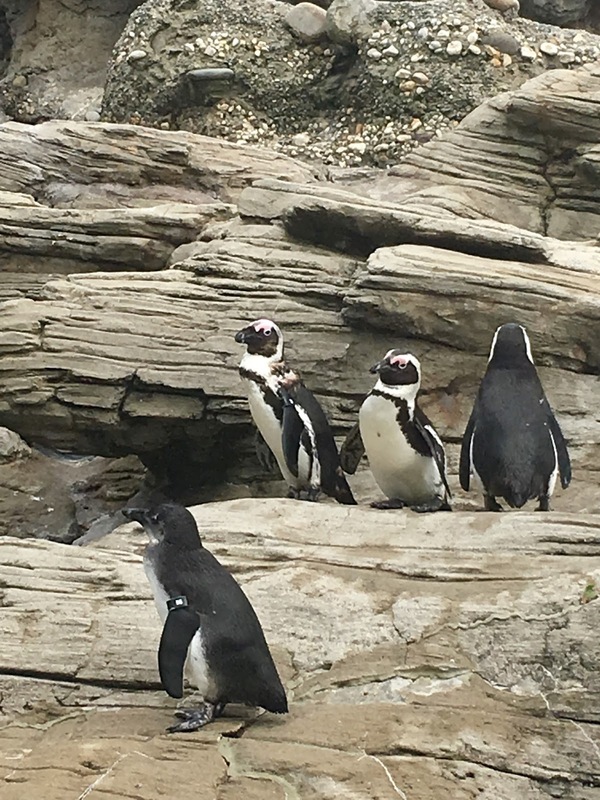 Love to see those cute penguins, critters in tuxedo :). And they make cute noises as well. What attracts most of my kids' attention is of course the Sharks temporary home. Bo has been smithen by sharks since he was on the 3rd grade. He has a lot of book about sharks and quite knowledgable about this amazing creatures. 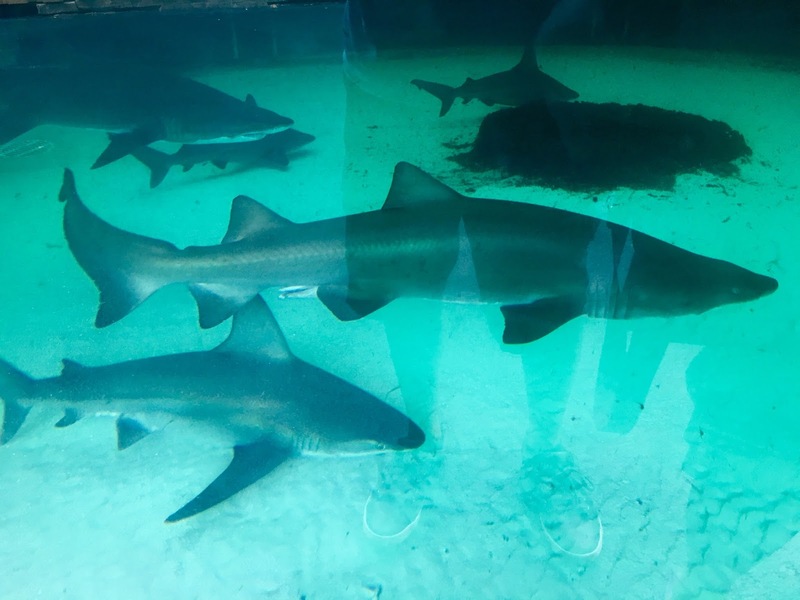 No wonder he was so happily flipped to see giants sharks in the nearby tank, together with giant mantarays. Before heading home, we watched the show at Aquatheater. It was so much fun indeed. 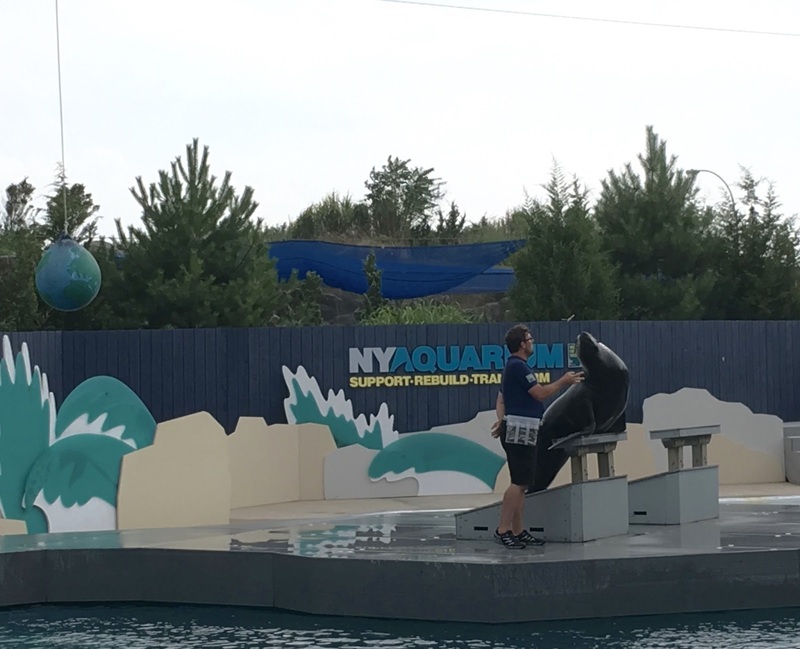 A 30-minute show with two intelligent sea lions who demonstrated great talents, including dancing, counting and mimicking. Super fun! Bo et Obi really love the show. You can also enjoy the animal feedings, scheduled at 10.30, 11.45, 1.30, 2.45, and 3.50 PM near the sea cliffs. We missed it because we wanted to see the aquatheater first. They also have 4-D theater featuring Spongebob Squarepants movie. I guess we have to go back here to watch it :). And don't forget to grab some lovely souvenirs from the aquarium. This way we can support the the NYAquarium project of rebuilding and transforming this oldest running aquarium in the US. 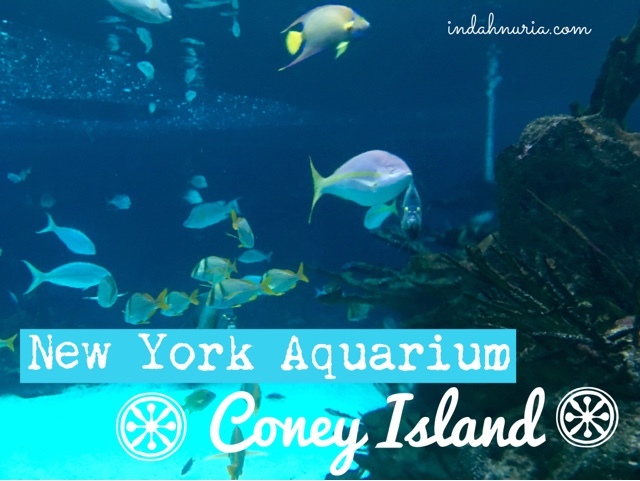 Visit New York Aquarium, Coney Island and have a fantastic time with your loved ones. We pretty much sure will go back here again :). It seems they have a vast array of marine life at the aquarium. I'd love to plan a family trip here some day! they do, Theresa. The kids enjoy it so much..
How neat! I have yet to make it to Coney Island! It's nothing like your homeland I'm sure, but it's still super fun to go there! Indeed it is, Alissa.. We truly enjoy it ..
Hiyy... Jd pingin ke seaworld lg.